The National Football League playoffs for the 1981 season began on December 27, 1981. The postseason tournament concluded with the San Francisco 49ers defeating the Cincinnati Bengals in Super Bowl XVI, 26–21, on January 24, 1982, at the Pontiac Silverdome in Pontiac, Michigan. Both conference champions had losing records the previous season, the only time this has happened. All four AFC playoff games were between teams who had never faced each other in the postseason before. This was the only time this happened in either conference since the playoffs were expanded to 10 teams in 1978. Bills defensive back Bill Simpson's interception at the Buffalo 1-yard line with 2 seconds left in the game preserved a 31–27 victory and gave Buffalo their first playoff win since 1965. This would also turn out to be the final NFL playoff game at Shea Stadium, as the Jets moved to Giants Stadium three years later. The Bills jumped to a 24–0 lead by the second quarter. First New York's Bruce Harper fumbled the opening kickoff while being tackled by Ervin Parker, and Charles Romes returned the ball 26-yards to the end zone. Then after a punt, quarterback Joe Ferguson completed a 50-yard touchdown pass to wide receiver Frank Lewis. On the Jets next drive, defensive back Rufus Bess intercepted a pass from Richard Todd and returned it 49 yards to the New York 12, leading to a 29-yard field goal by Nick Mike-Mayer. Now down 17-0, New York had a good chance to get back in the game when Mark Gastineau forced a fumble from Ferguson on the Bills next drive. Gastineau got to the ball before anyone else, but wound up accidentally knocking the ball forward twice while trying to pick it up, and Buffalo ended up recovering. Following a punt, Todd threw another interception, this one to linebacker Phil Villapiano, and the Bills converted it into a 24-0 lead on Ferguson's 26-yard touchdown pass to Lewis. However, Todd threw a 30-yard touchdown to tight end Mickey Shuler late in the second quarter. Then Jets linebacker Greg Buttle returned an interception from Ferguson 29 yards to set up Pat Leahy's 26-yard field goal, cutting the score to 24-10 at the end of the half. Leahy kicked another field goal in the third quarter to bring his team within 11 points. But with about 10 minutes left in the game, running back Joe Cribbs ran for a 45-yard touchdown, increasing the Bills lead to 31–13. Todd then led the Jets 80 yards in 8 plays and completed a 30-yard touchdown to Bobby Jones. Then after forcing a punt, New York drove for another score, aided by a pass interference call against Bills defensive back Mario Clark that nullified an interception. Kevin Long finished the 58-yard drive with a 1-yard touchdown run to cut the score to 31–27. The Jets got the ball back with 2:36 remaining and then drove 69 yards to the Buffalo 11-yard line, aided by a holding penalty that wiped out an interception by defensive back Steve Freeman. Todd also made several key completions, including a 29-yarder to Shuler and a 26-yard pass to Derrick Gaffney on 3rd and 20. However, Simpson's interception at the 1-yard line halted New York's comeback with 2 seconds left. Simpson recorded 2 interceptions, while Lewis caught 7 passes for a franchise postseason record 158 yards and 2 touchdowns. Shuler caught 6 passes for 116 yards and a touchdown. Todd threw for 377 yards, while Ferguson threw for 268. Both quarterbacks threw 2 touchdowns and were intercepted four times. Simpson and Buttle each had two interceptions. Despite playing without starting quarterback Phil Simms and linebacker Brad Van Pelt, the Giants jumped to a 20–0 lead in the first quarter and withstood an Eagles comeback at the end to hold on to a 27–21 win. In the first quarter, Eagles kick/punt returner Wally Henry fumbled a punt due to a hit from Lawrence Taylor and Beasley Reece recovered the ball for the Giants at the Philadelphia 26-yard line. A few plays later, quarterback Scott Brunner then threw a 9-yard touchdown to running back Leon Bright (the extra point attempt failed). Later in the first period, Brunner threw a 10-yard touchdown to wide receiver John Mistler. Henry muffed the ensuing kickoff, and as he tried to pick it up, he lost the ball while being hit by Mike Dennis. Giants defensive back Mark Haynes recovered the ball in the end zone to give New York a 20–0 lead. In the second quarter, Eagles quarterback Ron Jaworski completed a 15-yard touchdown pass to wide receiver Harold Carmichael, but it was countered by Brunner's 22-yard touchdown to wide receiver Tom Mullady to give the Giants a 27–7 halftime lead. However, New York was shut out in the second half, while the Eagles opened the third period by marching 82 yards to score on running back Wilbert Montgomery's 6-yard rushing touchdown. Montgomery added another touchdown with 2:51 left in the game, but the Giants were able to run out the rest of the clock, picking up gains of 6, 3, and 5 yards on runs by Rob Carpenter for a key first down. It marked the Giants first postseason victory since 1956. Brunner completed only 9 of 14 passes for 96 yards, but threw 3 touchdowns and only one interception. Most of the Giants offense came from Carpenter, who had 33 carries for 161 yards and 4 receptions for 32. The Cowboys crushed the Buccaneers, limiting them to 24 rushing yards and 222 total yards. Bucs quarterback Doug Williams threw 4 interceptions (three of which resulted in touchdowns), committed two intentional grounding penalties, and was sacked 4 times. After the first quarter was scoreless, Dallas defensive back Dennis Thurman's 19-yard interception return to the Bucs 47-yard line set up Danny White's 9-yard touchdown pass to receiver Tony Hill. Tampa Bay responded with a 59-yard drive to the Cowboys 21-yard line. But on 2nd down and 6, Dallas lineman Ed "Too Tall" Jones plowed through a block attempt by Charley Hannah and chased Williams all the way back to the 49-yard line before he grounded the ball with a desperate throw. The lost yardage on the grounding penalty pushed the Buccaneers out of field goal range and they ended up punting. Cowboys kicker Rafael Septien later added a 32-yard field goal to give the Cowboys a 10–0 halftime lead. A key aspect that had worked against Tampa Bay in the first half was starting field position. Their first half drives started from the 21, 20, 8, 20, 8 and 19-yard lines. Cowboys coach Tom Landry twice rejected long field-goal attempts from the 34 and 37, and each time White (who also played punter) punted the ball out of bounds at the 8. Dallas took the opening kickoff of the second half and marched 80-yards, including a 25-yard gain on a screen pass reception by Tony Dorsett, to score on running back Ron Springs' 1-yard rushing touchdown. Then rookie free safety Michael Downs picked off a pass from Williams and returned it 21 yards to the Tampa Bay 33, leading to Dorsett's 5-yard score that put the team up 24-0. On the next drive, defensive tackle John Dutton deflected Williams' pass into the arms of Ed Jones for an interception on the Bucs 25-yard line, and the Cowboys scored another touchdown with a 5-yard run by James Jones. In the fourth quarter, Williams completed a 75-yard pass to Jimmie Giles on the Cowboys 5-yard line, but the Buccaneers were still unable to get any points on the drive. On 2nd and 8, Williams was sacked by Harvey Martin for a 9-yard loss, and then turned the ball over with consecutive incompletions. Later on, a pass interference penalty in the end zone against Tampa Bay defensive back Cedrick Brown set up the final score of the game on Timmy Newsome's 1-yard run. White completed 15 of 26 passes for 146 yards and a touchdown. Dorsett was the top rusher of the game with 85 yards and a touchdown, while also catching 4 passes for 48 yards. Thurman had two interceptions and 50 return yards. Chargers placekicker Rolf Benirschke kicked the winning 29-yard field goal after 13:52 of overtime, ending a game that became known in National Football League lore as the Epic in Miami. This game set playoff records for the most points scored in a playoff game (79), most total yards by both teams (1,036), and most passing yards by both teams (809). On San Diego's opening drive, Dan Fouts' 47-yard completion to Wes Chandler set up Rolf Benirschke's 32-yard field goal. Then Miami was forced to punt and Chandler returned the ball 56 yards for a touchdown. On the ensuing kickoff, the ball hit the ground and bounced back in the Chargers direction, enabling them to recover it and eventually score on running back Chuck Muncie's 1-yard rushing touchdown. On the Dolphins next possession, Chargers safety Glen Edwards intercepted a pass from David Woodley and returned it 35 yards to set up Fouts' 8-yard touchdown pass to rookie running back James Brooks, which increased the score to 24–0. Early in the second quarter, Woodley was replaced by Don Strock who started off his first play with a 17-yard completion to Duriel Harris on a drive that Uwe von Schamann finished with a 34-yard field goal. Miami's defense subsequently recovered a fumble from Fouts, giving their offense the ball on the Chargers 39-yard line, and Strock took advantage, leading them to score on his 1-yard touchdown pass to tight end Joe Rose. Later on, Benirschke missed a 55-yard field goal attempt, giving Miami the ball with good field position. Three plays later from the 40-yard line, Strock took the snap and threw a pass intended for Duriel Harris at the 20-yard line. Harris caught the ball and immediately lateraled it to Tony Nathan, who then took it 25 yards to the end zone as time expired in the half, cutting the deficit to 24–17. In the third quarter, Miami drove 74 yards and tied it at 24, with Strock's 15-yard touchdown completion to Rose. San Diego countered with a 6-play, 60-yard drive to score on Fouts' 25-yard touchdown completion to tight end Kellen Winslow. But Miami re-tied the game with Strock completing six consecutive passes, the last a 50-yard score to Bruce Hardy. Then Miami defensive back Lyle Blackwood's interception set up a 12-yard touchdown run by Nathan, giving Miami their first lead of the game, 38–31, on the first play of the fourth quarter. Later on, with Miami just trying to maintain their lead and run out the clock, Chargers safety Pete Shaw recovered a fumble from Andra Franklin on San Diego's 18-yard line with 4:39 left in regulation. Fouts then led his team down to Miami's nine-yard line. With only 58 seconds left in the game, a heavy Dolphins pass rush forced Fouts to throw a blind pass intended for Winslow in the end zone. The pass sailed over Winslow's head, but went right into the arms of Brooks for a touchdown to tie the game. Miami took over on their own 40-yard line following Benirschke's squib kick, needing only a field goal to win. Following an incomplete pass, Strock's next throw was intercepted by Willie Buchanon, but as he made the diving catch, he fumbled the ball back to Miami when he hit the ground. After that, Nathan's 17-yard reception and Tommy Vigorito's 6-yard run moved the Dolphins to the Chargers 26-yard line where Von Schamann attempted a 43-yard field goal, but at the last second, Winslow extended his 6'5 frame at the line just enough to deflect the kick with his fingers, causing it to fall short of the goal posts and sending the game into overtime. In overtime, the Chargers took the opening kickoff and advanced to the Miami 8-yard line, but Benirschke missed a 27-yard field goal attempt. Then after both teams exchanged punts twice, the Dolphins reached the San Diego 17-yard line, only to see von Schamann's 34-yard attempt get blocked by defensive lineman Leroy Jones. Aided by two receptions from Charlie Joiner for 49 yards, The Chargers then drove 74 yards to the Miami 10-yard line, where Benirschke eventually kicked the winning field goal. Strock turned in the best game of his life, completing 29 of 43 passes for 403 yards and 4 touchdowns, while Fouts put on one of the best performances of his hall of fame career, completing 33 of 53 passes for 433 yards and 3 touchdowns. Harris caught six passes for 106 yards. Nathan rushed for 48 yards, caught nine passes for 114 yards, and scored two touchdowns. Muncie rushed for 124 yards and a touchdown. In addition to his 56-yard punt return touchdown, Chandler caught six passes for 106 yards. Brooks recorded 143 all-purpose yards. The image of an exhausted Winslow, who finished the game with 13 receptions for 166 yards and a touchdown, being helped off the field by two of his Chargers teammates has been constantly replayed ever since. The Bengals earned their first playoff win in team history after Bills quarterback Joe Ferguson's fourth-down pass fell incomplete while attempting to drive for the tying touchdown. Two key plays allowed the Bengals to start their first two drives in Buffalo territory, and they took advantage of their field position with touchdowns on each one. First, defensive back Mike Fuller returned a punt 27 yards to the Bills 42-yard line. Six plays later (one a 14-yard catch by tight end Dan Ross), Charles Alexander scored on a 4-yard touchdown run. On Buffalo's ensuing drive, defensive back Ken Riley intercepted a pass from Ferguson on the Bills 48-yard line. Cincinnati then drove 48 yards in 8 plays, including Isaac Curtis' 22-yard reception on 2nd and 17, to score with fullback Pete Johnson's 1-yard run, giving them a 14–0 lead before Buffalo had gained a single first down or completed a pass. After another Buffalo punt, Bengals quarterback Ken Anderson completed an 18-yard pass to Ross to give his team a first down on the Bills 41-yard line. Cincinnati eventually drove inside the 10, but the Bills made a key defensive stand, as defensive end Ken Johnson sacked Anderson at the 15 on third down and then Robb Riddick leaped high in the air to block Jim Breech's 33-yard field goal attempt. This seemed to spark Buffalo's offense, which subsequently picked up three first downs on a drive to the Bengals 30-yard line, but they also came up empty when linebacker Bo Harris intercepted Ferguson's pass and returned it 16 yards to the 24. Following a Bengals punt, Ferguson's 54-yard completion to Jerry Butler set up a 1-yard touchdown run by Joe Cribbs, cutting the score to 14–7 by halftime. Early in the third quarter, the Bills advanced 69 yards in five plays, starting with Ferguson's 15-yard pass to Frank Lewis and ending with a 44-yard touchdown run by Cribbs to tie the game. Cincinnati's David Verser returned the ensuing kickoff 40 yards to their 35-yard line, and the team responded with a 7-play 65-yard drive, including a 13-yard scramble by Anderson, to retake the lead with a 20-yard touchdown run by Alexander. Buffalo struck right back with a 79-yard scoring drive. Cribbs was injured and knocked out of the game on the first play, but his replacement Roland Hooks rushed five times for 24 yards and caught a pass for 6, while Ferguson finished the drive with a 20-yard touchdown pass to Butler, tying the game back up at 21 on the first play of the fourth quarter. With 10:39 left in the game, Anderson threw a 16-yard touchdown pass to rookie receiver Cris Collinsworth, giving the Bengals a 28–21 lead at the end of a 9-play, 79-yard drive that saw him burn the Bills with a 42-yard completion on a short pass to Steve Kreider on 3rd and 1 from the Bengals 42-yard line. The Bills drove to the Cincinnati 21-yard line with about three minutes left to play, and it appeared that Ferguson completed a fourth-down pass to Lou Piccone to gain a first down. However, Buffalo was called for a delay of game penalty, and Ferguson's pass attempt on the next snap fell incomplete. The Bills defense managed to force a punt with under a minute left, but Ferguson threw four consecutive incompletions as time expired in the game. Buffalo's miscue on their final drive was particularly noteworthy in that it came after they had called a timeout, making a subsequent delay of game penalty highly unusual. One cited reason for this was the last second substitution of receivers Lou Piccone and Ron Jessie into the huddle. Bills coach Chuck Knox later explained this was an attempt to prevent the defense from adjusting to new personnel, an attempt that would have paid off if the ball had been snapped on time, as Piccone did make a first down catch on the ensuing play. Anderson finished the game with 14 of 21 completions for 192 yards and a touchdown. Johnson, the team's leading rusher with 1,077 yards during the season, was held to just 45 yards, but it did not matter as the Bengals still racked up 136 yards on the ground, 72 of them and two touchdowns from Alexander. Ferguson threw for 202 yards and a touchdown, but completed only 15 of 31 passes and was intercepted twice. Cribbs finished with a career postseason high 90 rushing yards and 2 touchdowns. Butler caught 4 passes for 98 yards and a score. 25-year-old San Francisco quarterback Joe Montana led the 49ers to victory in his first ever playoff game, completing 20 of 31 passes for 304 yards and 2 touchdowns, with 1 interception. His top target in the game was receiver Dwight Clark, who caught 5 passes for 104 yards. The 49ers jumped to a 24–7 lead in the second quarter, and scored 2 touchdowns in the final period to secure the victory. San Francisco took the opening kickoff and advanced 85 yards to score on Montana's 8-yard touchdown to tight end Charle Young. The Giants countered with quarterback Scott Brunner's 72-yard touchdown completion to wide receiver Earnest Gray. Then after the 49ers went ahead, 10–7, in the second quarter, San Francisco defensive back Ronnie Lott intercepted a pass from Brunner to set up wide receiver Freddie Solomon's 58-yard touchdown reception. Linebacker Keena Turner recovered a fumble on the first play after the ensuing kickoff, and Ricky Patton scored on a 25-yard touchdown run a few plays later to give the 49ers a 24–7 lead. Later, a 48-yard field goal by New York kicker Joe Danelo made it 24–10 at halftime. In the third quarter, Brunner completed a 59-yard touchdown pass to wide receiver Johnny Perkins to make it 24–17. But in the fourth quarter, running back Bill Ring scored on a 3-yard rushing touchdown, and Lott returned his second interception of the game 20-yards to the end zone. Brunner then made a 17-yard touchdown to Perkins to close out the scoring. CBS's broadcast of the Giants-49ers NFC Divisional Playoff game also featured the introduction of the telestrator to a national audience. In a game subsequently known as the Freezer Bowl, the Bengals defeated the Chargers 27–7. Despite a game-time temperature of −9 °F (−23 °C) and a 35-mile-per-hour wind that sent wind chills as low as −59 °F, Bengals' quarterback Ken Anderson threw for 161 yards and 2 touchdown passes, with no interceptions, and rushed for 39 yards to lead his team to a victory. Cincinnati's defense intercepted San Diego quarterback Dan Fouts twice and recovered 2 fumbles, while their offense didn't commit a single turnover until late in the third quarter when they already had a solid lead. Aided by an 18-yard completion from Anderson to tight end Dan Ross, Cincinnati scored first with a 31-yard field goal from kicker Jim Breech. Then linebacker Rick Razzano forced a fumble from Chargers' rookie kick returner James Brooks, and Don Bass recovered for the Bengals on the San Diego 12-yard line. Following a 4-yard run by Charles Alexander, the Bengals scored a touchdown on an 8-yard pass from Anderson to tight end M. L. Harris, increasing their lead to 10–0. Brooks returned the ensuing kickoff 35 yards to the 43-yard line. Then on 3rd down and 9, Fouts' 21-yard completion to Wes Chandler moved the ball to the Bengals 33. But Cincinnati's defense halted the drive at the 18-yard line and it ended with no points when Rolf Benirschke missed a 37-yard field goal attempt. After a Bengals punt, Chandler gave the Chargers good field position with a 7-yard return to the 45-yard line. San Diego then drove 55 yards and cut their deficit to 10–7 when Fouts, desperately trying to avoid a hit from lineman Eddie Edwards, managed to fire a pass to Kellen Winslow at the line scrimmage, who subsequently raced 33 yards down the right sideline for a score. But the Bengals stormed right back on a drive set up by David Verser's 40-yard kickoff to the 46-yard line. Faced with 3rd down and 7 inside the red zone later in the drive, Anderson kept the drive going with a 16-yard completion to Isaac Curtis on the Chargers 1-yard line, and fullback Pete Johnson scored a touchdown run on the next play, giving them a 17–7 lead. The Bengals completely took over the game from that point on. The Chargers would move the ball inside the Bengals 40-yard line five times during the rest of the game, but failed to score on each possession. San Diego responded with a drive to the Bengals 33-yard line, but came up empty when defensive back Louis Breeden intercepted a deep pass intended for Charlie Joiner at the 5-yard line. The Chargers defense quickly gave the offense another scoring opportunity, forcing a punt from Pat McInally that went just 32 yards to the Bengals 45. But once again this amounted to nothing as Fouts was intercepted in the end zone by rookie safety Bobby Kemp. On the opening drive of the second half, San Diego drove to the Bengals 38-yard line, only to lose their fourth turnover of the day when Reggie Williams stripped the ball from Chuck Muncie and Cincinnati lineman Ross Browner recovered it. Then Anderson went to work, rushing three times for 31 yards and completing a 19-yard pass to Ross on a drive that moved the ball inside the San Diego 10-yard line. Following three incompletions and a touchdown called back by a holding penalty, Breech's 38-yard field goal made the score 20–7. On their next drive, Anderson's five completions moved the ball deep into Chargers territory, but defensive back Willie Buchanon put an end to it when he recovered a fumble from Ross that had been forced by Woodrow Lowe. The Chargers then drove to the Bengals 20-yard line, but on third down, Fouts tripped over the foot of guard Doug Wilkerson and was downed for an 11-yard loss. Then Benirschke missed a 50-yard field goal try on the next play. Taking the ball back after the missed field goal, Cincinnati put the game away with a 14-play touchdown drive. Anderson was injured early in the drive and replaced for two plays by Jack Thompson. But Johnson kept the Bengals moving on those plays, first rushing for 8 yards and then gaining 14 yards on a screen pass on 3rd down and 8. Later on the drive, Johnson converted a 4th and inches situation with a 7-yard run, and Anderson eventually finished it off with a 3-yard touchdown pass to Don Bass, making the final score 27–7. San Diego responded with a drive to the Bengals 5-yard line, but turned the ball over on downs with less than three minutes left. Dwight Clark pictured making "The Catch" that helped take the 49ers to Super Bowl XVI. 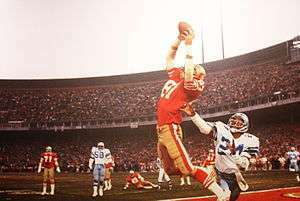 In a play that would become known as The Catch, 49ers wide receiver Dwight Clark made a leaping grab at the back of the end zone to score the winning touchdown with 51 seconds left in the game. The win sent the 49ers to their first Super Bowl and snapped their three-game playoff losing streak to the Cowboys. After forcing Dallas to punt on the opening drive, San Francisco quarterback Joe Montana completed a 17-yard pass to Charle Young and a 24-yarder to Lenvil Elliott before throwing an 8-yard touchdown pass to wide receiver Freddie Solomon. Dallas responded with Danny White's 20-yard pass to Butch Johnson setting up a 44-yard field goal by Rafael Septien. Then 49ers running back Bill Ring lost a fumble on his own 29, leading to White's 26-yard touchdown pass to Tony Hill that put the Cowboys up 10-7. In the second quarter, San Francisco reached the Cowboys 27-yard line, only to lose the ball when Everson Walls intercepted a pass from Montana in the end zone. But after forcing a Dallas punt, Montana threw a 20-yard touchdown to Clark to retake the lead, 14–10. Dallas responded with an 80-yard drive, including a controversial pass interference penalty on 49ers defensive back Ronnie Lott which nullified his interception and gave the Cowboys a 35-yard gain at the San Francisco 12-yard line. Three plays later, running back Tony Dorsett scored on a 5-yard rushing touchdown to give Dallas a 17–14 lead. The 49ers got another chance to score before halftime when they recovered a fumbled punt on the Dallas 42. But after a 15-yard illegal block penalty on Clark, Montana lost a fumble while being sacked by Harvey Martin. The Cowboys fared no better as White was sacked twice on their next drive, once by Jim Stuckey and once by Lawrence Pillers, and the half ended soon after. In the third quarter, San Francisco got another scoring opportunity when Dwight Hicks returned a punt 12 yards to midfield. The 49ers then drove to the Dallas 16-yard line, but once again they failed to score when Montana threw a pass that bounced out of Elliot's hands and was intercepted by Randy White. However, the Cowboys soon returned the favor with Danny White's interception to linebacker Bobby Leopold, and this time the 49ers converted, regaining the lead at 21-17 with a 2-yard touchdown run by running back Johnny Davis. One minute into the fourth quarter, Septien kicked a 22-yard field goal that cut the scoring difference down to 1 point at 21-20. Then Walls recovered a fumble from running back Walt Easley at midfield to set up White's 21-yard touchdown pass to tight end Doug Cosbie, giving Dallas a 27–21 advantage. Things got even better for Dallas when Walls recorded his second interception from Montana on the next drive at the Cowboys 27. Dallas managed to pick up a few first downs, but was forced to punt, and White's kick gave San Francisco the ball at their own 11 with 4:54 left in the game. Montana subsequently led the 49ers 83 yards to the Dallas 6-yard line. Elliott rushed 4 times for 30 yards on the drive, while Solomon also made a big impact, catching two passes for 18 yards and rushing for 15 on a WR reverse. Facing 3rd down and 3 on the Cowboys 6 with 58 seconds left, Montana threw a high pass that Clark just managed to break ahead of Walls and reach in the air for the game-winning touchdown reception. Other contributors on the final 89-yard drive that led to the play now referred to as “The Catch” included Freddie Solomon (WR), Lenvil Elliott (RB), Earl Cooper (FB), Mike Wilson, Charle Young (TE), Dan Audick (LT), John Ayers (LG), Fred Quillan (C), Randy Cross (RG), and Keith Fahnhorst (RT). However, the Cowboys needed only a field goal to win, and still had enough time left in the game for one last drive. White threw a completion to Drew Pearson that almost went for a touchdown, but 49ers defensive back Eric Wright made a key tackle by getting one hand inside Pearson's jersey and dragging him down. One play later, Pillers sacked White, forcing a fumble that was recovered by Stuckey, and the 49ers had their victory. Clark finished the game with 8 receptions for 120 yards and two touchdowns. Dallas defensive back Everson Walls intercepted 2 passes and recovered a fumble, though he had the misfortune of being assigned to cover Clark on "the catch" play. San Francisco won despite losing 6 turnovers.